My brother Peter took these Anakie photos during a lunch break. He’s a survey officer with a water board down Geelong way, which ties in with the Anakie Football Club’s early days. 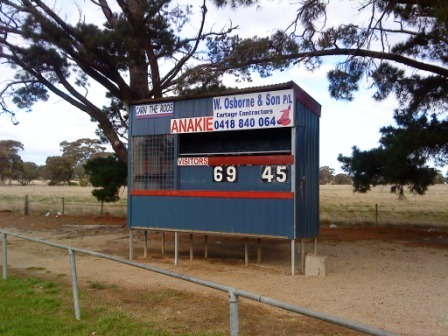 Anakie and Winchelsea play in the Geelong & District Football League. Anakie was formed in 1897. They wear red and blue and call themselves the Kangaroos. The last of their five senior flags was in 1994, when they defeated North Geelong by 13 points. This year the Roos broke even, finishing seventh on the 12 team GDFL ladder, with nine wins and nine losses. The township of just a few hundred people is half an hour north of Geelong, on the way to the Brisbane Ranges National Park. And not far from the old-fashioned Fairy Park, where stories of the Brothers Grimm are brought to life amongst the granite boulders and the gum trees. 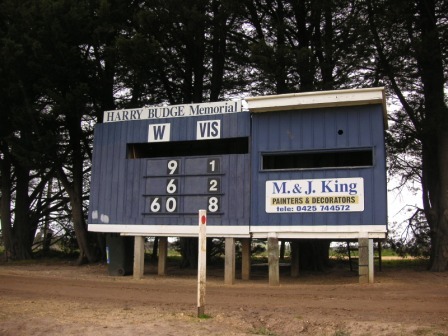 Winchelsea has had a shocker of year, a grim year, losing games by huge margins. The Blues lost to Corio by one point in Round 12 and then lost games by 142, 176, 188, 197, 267 and, finally, 192 points. So I got some old numbers from the boot (there were none inside the Harry Budge Memorial Scoreboard) and propped them up to show the Blues leading the way at quarter-time in an imaginary match. Hopefully Harry Budge wouldn’t have minded. 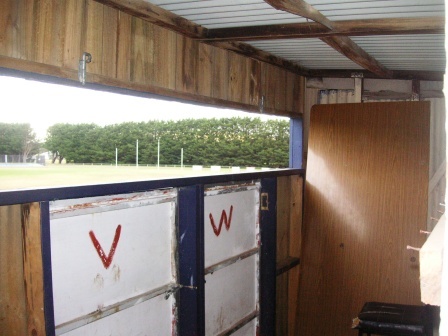 Winchelsea’s home ground is at Eastern Reserve, which is surrounded by cyprus trees. 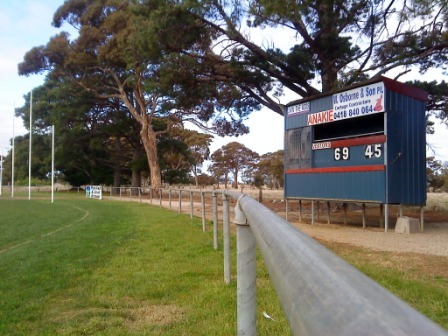 The township is half-an-hour west of Geelong, on the way to Colac. In 1859 English settler Thomas Austin thought it might be fun to introduce rabbits to Australia. For a spot of shooting on his homestead. The rest, as they say, is history. Here’s hoping the Blues have a better year next year.